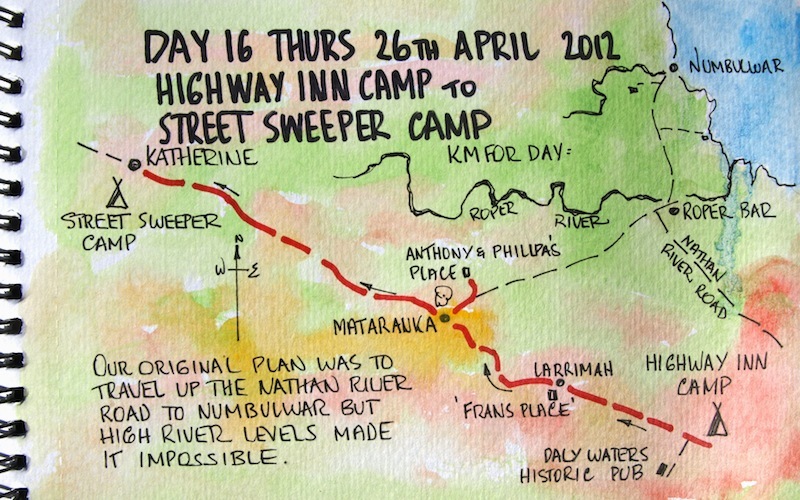 The Hi-Way Inn, our wet day rest camp,doesn’t really cater for the likes of us when it comes to cooking. There was no camp kitchen, only a barbecue. To be able to cook I manoeuvred one of the barbecue hot plates and exposed the burner underneath which meant I could cook the porridge and even make toast. During breakfast two resident dogs and a duck visited us. 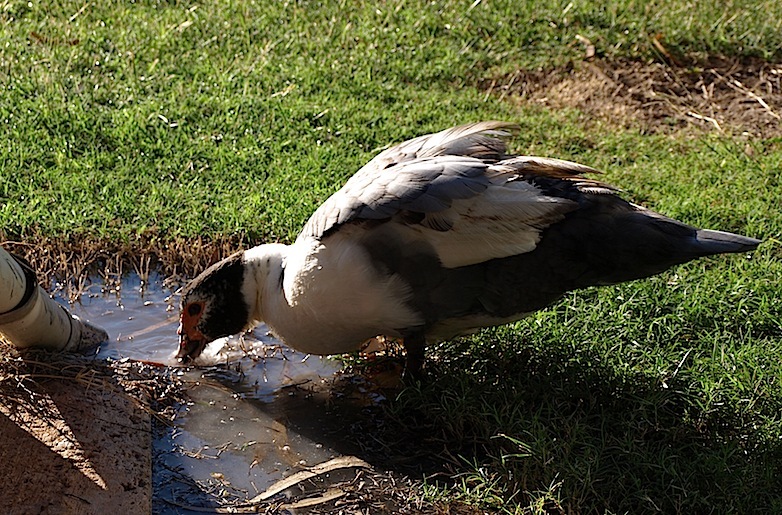 The duck was smart as when I pulled the plug in the sink after washing the porridge pot it went immediately to the open discharge pipe and shovelled its beak in the outflow and extracted the porridge scraps! After the rain the air was clear and fresh, a great day for being on the road. First stop today was for morning tea at Fran’s Place, a roadside café at Larrimah north of Daly Waters. The establishment reminded me of a roadside stall in India, nothing sophisticated but very functional. The place comprised a conglomeration of beat-up old caravans, dongas, garden sheds and corrugated iron lean-tos but we were not put off because some of these amusingly eccentric looking places yield entertainment. The homemade scones with mango jam and hand-whipped cream were superb. Bev says the coffee was good too. I asked for herb tea. “Sorry darlin’, there is not enough call for them sort of teas”, so I went to the car and got my own tea bag; she didn’t charge for the hot water. Fran is a hoarder and she specialises in dog ornaments. When we first arrived she said the dogs were not for sale, they were her pets. When Bev and I are on the road we make a point of going out of our way to talk with strangers and visit the non-touristic establishments. Aaron, the long distance bike rider, was at Fran’s when we got there; he was fuelling up on scones, mango jam and cream. I asked him if he was averse to accepting rides in cars, he replied in the negative so we hoisted his bike on top of our kayaks and took him on to Katherine from where he intended to ride to Darwin and see if he could hitch a ride on a boat to Asia. The clear air didn’t last long because at this time of the year in the NT the authorities, landowners and locals start serious hazard reduction burning. Every man and his dog is out there burning. The NT is a pyromaniac’s paradise. Along the way today there were roadside fires blazing, one bloke was riding a quad bike at speed with fire stick in hand, spurting fire as he went. Hundreds of black kites circled along the fire front, swooping and feeding on insects and creatures fleeing the fire. 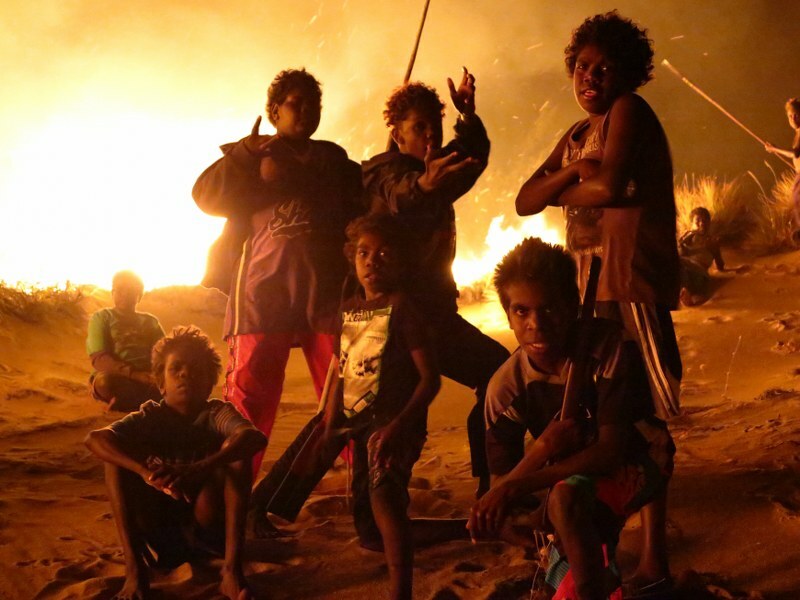 Of course Aboriginal people in Australia carried out what is now known as firestick burning. They burnt the countryside to encourage fresh grass growth on to which kangaroos came to feed and as their fires traversed the countryside they, like the black kites today, could gather a snake or goanna etc. fleeing the fire. Beats pushing a trolley around a supermarket! 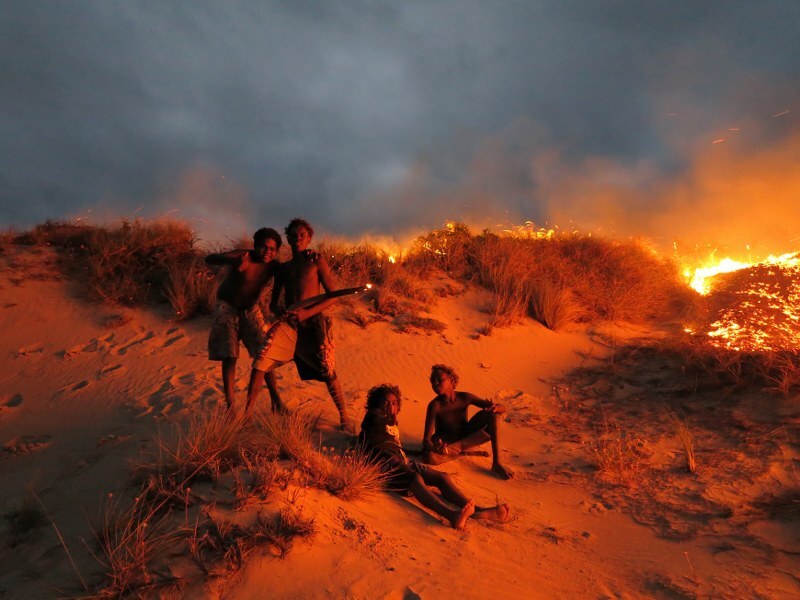 Fire to Aboriginal people is a very important element. If they are not lighting fires to drive off snakes and spiders at a campsite they are firestick farming or, in the case of young boys, playing with it. Playing with fire, Top End style. Photo from the Tim Hillier collection.